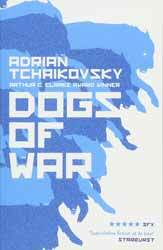 Dogs of War (2018. 346 pages) is a speculative science fiction novel from Arthur C. Clarke award winner, Adrian Tchaikovsky, who is best known as the author of the Shadows of the Apt series of novels. The book is set in the near future when mankind has abandoned the use of robots in its wars and instead have created a new slave race, born to serve, born to kill. The central protagonist is Rex, who remains under the thraldom of Murray who is using the cyborgs to prosecute a dubious war in South America. Redmark, the conglomeration behind the Bioforms sends a representative to see how their creations are being used. Between a murder and the breakdown of communications between their basecamp and the pack, Rex and his group are set free, but what does freedom mean when you are a human construction. This could have just been an interesting tale involving new technology, but Tchaikovsky uses it to discuss the nature of what it means to be intelligent and whether humanity can extend to its creations the same rights as they themselves enjoy. Personally, I would have liked a larger exploration into distributed intelligence and what that will mean for humans, but maybe that’s a book for another day. The author does well in capturing the traits of each of the characters. Rex is obedient and is happiest around humans, being told that he is a good dog. He is not the most intelligent member of his pack, that appears to be Honey. The Bioforms are based on more than one creature and where Rex’s traits make him the perfect slave, Dragon, who is based on a lizard, is more interested in sleeping in the sun. Through their tale of initial emancipation followed by the pack being placed on trial the book ponders questions about whether war is ever ethical and whether humans can also be as humane as their creations. The story is told from multiple points of view allowing the reader to come to their own decisions about the ethical and philosophical issues raised. This is a thoughtful novel with much for the reader to process. Some of the possibilities it provides are downright scary, but it taps into the current zeitgeist over our worries about where technology might be heading.